COLUMBIA, S.C., Aug. 10, 2015 – For years, Army Sgt. Brian Calhoun, a photojournalist in the 108th Public Affairs Detachment, South Carolina National Guard, has balanced his day-to-day civilian life and military obligations. Calhoun initially joined Headquarters and Headquarters Battalion 1/263 Air Defense Artillery, a brand-new unit where he served for seven years as an Air Defense Artillery Command and Control System Operator-Repairer. When that unit was deactivated, Calhoun was at the end of his enlistment and decided to leave the National Guard. Calhoun’s “short” break from the military ended up lasting 16 years. In 2010, Calhoun decided to re-enlist and he turned to the Internet to find the perfect job. As a licensed funeral director, Calhoun has worked for J. Henry Stuhr, in Charleston, South Carolina, for nearly 17 years. He currently serves as the firm’s director of information technology. In 2015, Calhoun graduated from the Warrior Leader Course held at McCrady Training Center in Eastover. WLC is the initial leadership course for noncommissioned officers. During this month-long course, the specialists and corporals are being prepared for the rank of sergeant by learning skills to lead smaller groups of soldiers. Calhoun felt that being older gave him an advantage throughout the course. On top of holding down a steady civilian job, Calhoun also has a wife and two children. 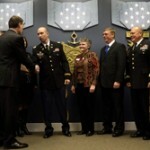 His family, he said, had as much to do with his re-enlistment as did his own personal desire to be back in uniform. The National Guard responds to natural disasters such as floods, hurricanes, forest fires, search-and-rescue operations, counter-drug operations, among others. On top of that, the National Guard has a federal mission to maintain well-trained units available for mobilization during war or national emergencies.